Kit's Kindergym Treasures: Our crazy gym! 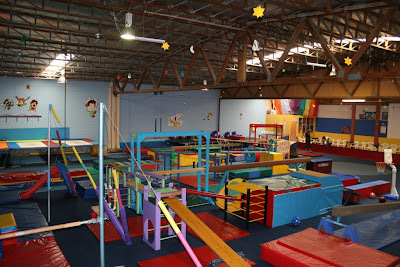 Here is a picture of our wonderful colorful gymnastics club. Over the years I have visited many gyms and observed many classes in action, which gave me the opportunity to decide what I wanted to have in our facility. So, when I decided to set up our gym (16 years ago), I was clear on one thing....it had to be fun! I wanted to provided a clear image of fun as soon as you walked through the door. I do believe we have achieved this, but we are always trying to improve. I knew what our philosophy was going to be and we have been true to it ever since we opened. However, in the world of gymnastics, many see us as a "play gym". A place that does not teach "true" gymnastics. I always smile at these comments and feel sorry for those who only believe that there is one way to teach this wonderful sport and in one type of gymnastics facility. We have chosen to be a recreational club for many reasons but we still achieve skills and results in this wonderful crazy facility. Hope you like this picture of half our gym.